Metung a civilian GPS receiver ("GPS navigation device") a magagamit king dayatmalat. Ing automotive navigation system king metung a taxi. Magagamit no kareng dakal a cellphone deng GPS receiver. 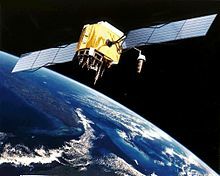 Ing Global Positioning System (GPS) metung yang sistema ning pamaglayag a pangyatung gagamit satellite (global navigation satellite system) (GNSS) a ayalkus ning United States Department of Defense, at panibalan ning United States Air Force 50th Space Wing. Ya kabud ganap a gaganang GNSS king yatu, maliari yang gamitang timawa ampong alang bayad, at maras, magsilbi ya kareng sibilian king pamaglayag. Gagamit yang constellation da reng pilatan ning 24 ampng satellite a Medium Earth Orbit a magparalang eksaktung senias a microwave, a sasaup kareng GPS receiver a mangarcula king salukuyan dang pusisiun o kabilian, ing oras, ampo ing karelang bilis o salusu (velocity). Ing opisial nang lagiu, NAVSTAR GPS. Lipat ning e ya acronym ing NAVSTAR, melalang la reng mapilan a en:backronym para kaniti. Manibat aniang ganap deng pepagana aniang 1993, meging maleparan ing pamangamit ning GPS antimong saup king pamaglayag king mabilug a yatu, ampong metung a maulagang kasangkapan king pamangawang mapa, pamaniukad gabun, negosiu, gamit a pang-siensia, ampong hobby antimong en:geocaching. Bukud kaniti, magsilbi ya ing saktung time reference kareng dakal a pigagamitan, alimbawa ing sientipicung pamanigaral kareng ayun. Metung ya muring maulagang pamangailangan king pamiagnan-agnan da reng cellular network, anti ing Qualcomm CDMA air interface a gagamitan da reng dakal a wireless carriers kareng miayaliwang bangsa. ↑ Steven R. Strom. Charting a Course Toward Global Navigation. The Aerospace Corporation. Retrieved on 2008-06-27. ↑ What does NAVSTAR stand for? National Space-Based PNT Executive Committee—Established in 2004 to oversee management of GPS and GPS augmentations at a national level. USCG Navigation Center—Status of the GPS constellation, government policy, and links to other references. Also includes satellite almanac data. The GPS Program Office (GPS Wing)—Responsible for designing and acquiring the system on behalf of the US Government. GPS Academy Garmin interactive video web site explaing what exactly GPS is and what it can do for you. HowStuffWorks Simplified explanation of GPS and video about how GPS works. The WhereAmI Project — The WhereAmI Project. Personal Location Tracking and Publishing Service. GPS SPS Performance Standard — The official Standard Positioning Service specification (2008 version). GPS SPS Performance Standard — The official Standard Positioning Service specification (2001 version). GPS PPS Performance Standard — The official Precise Positioning Service specification. Dana, Peter H. "Global Positioning System Overview"
History of GPS, including information about each satellite's configuration and launch. Crosslink Summer 2002 issue by The Aerospace Corporation on satellite navigation. Improved weather predictions from COSMIC GPS satellite signal occultation data. David L. Wilson's GPS Accuracy Web Page A thorough analysis of the accuracy of GPS. Innovation: Spacecraft Navigator, Autonomous GPS Positioning at High Earth Orbits Example of GPS receiver designed for high altitude spaceflight. The Navigator GPS Receiver GSFC's Navigator spaceflight receiver. A look at the future of GPS, Ingenia magazine, March 2008. Tauli yang miyalilan ining bulung anyang 17:28, 1 Mayu 2015.